What is a web survey? Before we talk about the web survey, let’s start by discussing what a survey is. A survey is a method of gathering information from a number of individuals, known as a sample, in order to learn something about the larger population from which the sample is drawn. Some surveys focus on opinion and attitudes while others simply collect factual information. There are many ways to ask questions through surveys. Questions can be open-ended, in which the respondent must elaborate on their response, or closed, for example, they must simply provide a yes/no answer. Surveys can also gather information by asking the respondent to simply rate or rank items. 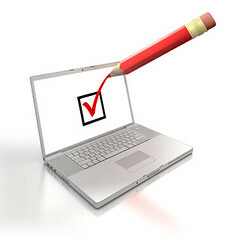 A web survey is a cost-effective solution to the regular mailed survey. Other advantages of the web survey are that can be mass-emailed to all surveyees, or even embedded in a website. Many businesses nowadays use a web survey tool in hopes of obtaining quick feedback. Businesses invest in web survey tools in hopes of obtaining quick, clear and objective information from their customers. To do this, the survey must be carefully designed. Questions asked must be clear, for if the respondent is unable to understand a question, the data is neither valid nor reliable. Questions must also be phrased in a way that minimizes interpretation problems and the language used must be understandable by those being surveyed. While a web survey, when carefully crafted, does lead to positive results, it can be challenging and time-consuming to build, and decipher. OneDesk makes surveying easier. This web-based software come with a customer feedback application, which customers can use to submit feedback to your company, answer polls you create, and vote on feedback. Gone are the days where you have to spend a lot of time deciphering your customers’ answers. If a feedback is unclear, simply use OneDesk’s social collaboration tools to immediately communicate with the customer and get clear answers. OneDesk also allows you to link feedback to requirements and obtain objective information as to which ones to implement. Find out more information about OneDesk’s customer portal. You can also read about OneDesk’s requirements analysis tools.